Michael: To be a Yankee fan is such a father-to-son tradition. Is that still the case today? Does baseball still link the generations? Marty: The link from generation to generation has always been one of baseball’s strengths. Like your father seeing Mickey Mantle play and your grandfather seeing Joe DiMaggio play, and then comparing the. Yankee stadium is royal territory not only for Yankee fans but baseball fans everywhere. Michael: By the way, who came before DiMaggio? Marty: Earle Combs. A forgotten guy today. Most people wouldn’t know his know his name. But he was a Yankee centerfielder in Babe Ruth’s time, and he’s in the Hall of Fame, and he was the first 6-footer who was a leadoff hitter in baseball. He revolutionized the position in that sense. So one of the little things that’s so satisfying for me is to make people aware of forgotten names like that, and to help them realize when you’re talking about centerfield Yankee Stadium, it doesn’t begin with DiMaggio. It began with Earle Combs. Michael: How did you know all that? Marty: When I was a kid, it mattered! I’m also aware of the fact that when I was a kid, we only had 50 years of baseball history to catch up with. Today’s kids have more than double that, so it’s a much more daunting task today. That’s part of why I wrote Pinstripe Pride, to give kids a chance to get caught up! Michael: One of the big changes from our era to the current one is simply the cost of a ticket, or the cost of going. It’s almost prohibitive to take a family of 4 or 5 to a game. Marty: What you’re saying is true, but yet when I was a kid and the tickets were $3.50 and $2.50 and a buck and a half, it’s hard to believe now, but it was a leap to go from $2.50 to $3.50, and we never did it. I never could afford or imagine having box seats. $2.50 was just right. $3.50 was unimaginable. It sounds ridiculous to say that today, but that was the way it was. Michael: How do like Yankee Stadium compared to the prior version? Marty: I like it. I hear a lot of criticism from people who talk about it being a giant shopping mall and all of that. But when I’m looking out on the field, it’s Yankee Stadium to me. They managed to capture the original stadium, and the grandeur and the history, and that’s good enough for me. Michael: How did you like the previous version of the Stadium? Marty: I’m the last guy active in the field of sports who worked in the original stadium. I knew every inch of it and I loved it. But the remodeled stadium from ’76 to ’08 — that place rocked when times were good. There was excitement. When people say, “Oh, it wasn’t like the original,” they’re forgetting that the original had all these obstructed views and no escalators. So I thought that second version was awfully good. 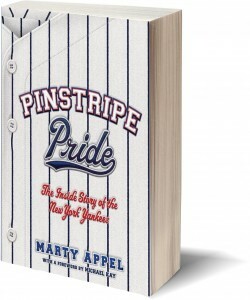 Michael: What are the stories that you tell in “Pinstripe Pride” that kids most resonate with? Marty: Reggie Jackson’s three home runs in the World Series in that last game in ’77. It was not only history, but it was the culmination of a dramatic year. It was his first year with the Yankees. The manager didn’t want him hitting cleanup. His teammates didn’t like him. The fans felt he wasn’t giving them enough. And then like a Shakespearean drama, he rises to the occasion on the last day and just sets baseball history with those three home runs. He looked so heroic doing it — the way he would just hit the ball and strike that pose at home plate watching it settle into the stands. Michael: Were they all on the first pitch, or is that just an enhancement of the memory? Marty: It wasn’t first pitch; it was first swing. He didn’t hit any foul balls or swing and miss. It was the first swing on all three of them. Michael: How do you look back on the Steinbrenner era? Marty: I was the Yankees’ PR guy when Mr. Steinbrenner came along at age 42 and bought the team. Of course, we had no idea the impact he was going to make on the game and the importance he himself was going to have in baseball history. But by the time it was done, he had really changed the way owners perform. He became an activist owner which not too many of them had existed before. And although he wasn’t a New Yorker by birth, he had that swagger. He became a symbol of New York excellence. The fans easily bought into that, because that’s the style they liked to identify the Yankees with. Michael: Of all the people you’ve worked with, the players, or the people on the inside, or that broadcast with the Yankees, who do you look back on most fondly? Michael: I’m wondering if you could tell me a Yogi Berra story, and it doesn’t even have to be true. Marty: Some of them were! I may have been fortunate enough to be present for the last Yogi-ism. He spent his final days in an assisted living care facility in New Jersey, and I didn’t visit him the whole time he was there, out of respect for his privacy. And then this past summer, I just thought, why am I doing this? He’d probably love a visit from somebody he knows and to talk a little baseball. So I went out there and spent a couple of hours with him in his room, and around the time I was getting ready to leave, there was a nurse in the room, and he said to the nurse, “What time is 3:30 Mass?” And I thought to myself, I don’t know how long Yogi’s got, but this may be the last Yogi-ism, and I was here for it. Michael: You started off handling fan mail for Mickey Mantle. The letters weren’t especially interesting. They pretty much were all requests for autographed balls, but I always managed to somehow squirrel away two or three that I needed to go over with him in person, making it up just so that I could have some face time with Mickey. And he kind of saw through me, he knew that I really didn’t need to go over these letters with him in person, and he was kind of amused by that. Michael: You were 19 when you started with the Yankees. Marty: I was the youngest guy on the scene, and I had such an appreciation for baseball history. I was meeting sportswriters who had been covering the team since the 1920s, and I couldn’t ask enough questions. Michael: Was there a story you heard that you couldn’t necessarily put in Pinstripe Pride? Marty: I’ll tell you one. Lou Gehrig’s successor at first base was a fella named Babe Dahlgren, and he was a pretty good ballplayer, because the year he succeeded Gehrig in 1939, that team won the World Series and is considered one of the best teams in baseball history. That’s with Dahlgren at first. In 1940, the Yankees finished third, but just a hair out of first place, and that interrupted what would have been 7 straight pennants. Amazing. Michael: That story sheds so much light on the relationship between the press and baseball figures and the managers and players back then, because he knew that no one would ever put something like that in the paper. 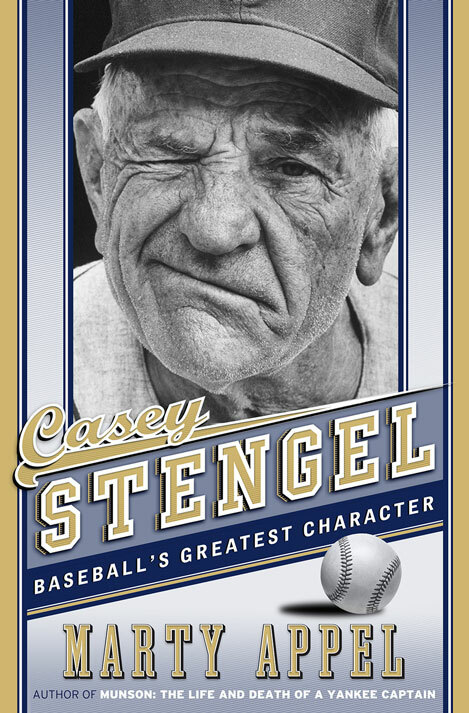 Michael: You knew Casey Stengel. Michael: Tell me about Phil Rizzuto. Marty: I had the pleasure of not only working alongside him when I was the PR guy, but later in my career I became the producer of the telecasts, so I was his boss. And what a kick that was! Nobody’s kidding anybody here, he was the boss, but what I came to appreciate in that was, what a gifted broadcaster he was, even though he would never admit to it, and never want people to think of him that way. He liked people thinking of him as just this lucky player who loved baseball and had this chance to be a broadcaster. Michael: Bill White, who worked with Rizzuto, was no slouch, either. Michael: Is it harder to win today with the multi-tiered system of playoffs and free agency, or was it harder to win when you had to come in first in your league to advance? Marty: I don’t want to take anything from all of those Yankee teams of the 20s, and 30s, and 40s, and 50s, and 60s, but it’s much harder today. You’ve got 13 competitors in your league, not 7. You’ve got 3 rounds of playoffs. You’ve got players who are long-term contracts who speak so many different languages. And the Yankee situation, in this market, you’ve got all the second-guessing going on with sports talk radio, and social media second-guessing, you can’t just ever shut it off and go home and tomorrow is another day. So it’s much tougher today, and that’s why, I think, Joe Torre, is probably the best manager in the history of the Yankees, with all due respect to the others, but he had all this to deal with, plus a very demanding boss, and the other guys didn’t have anything like that at all. Michael: How do you like the Yankees this year? Marty: I’m very excited for this year. People talk about the relief pitchers and how thrilling that might be, those three studs, but I’m really excited to see Didi Gregorius and Starlin Castro at shortstop and second. I think that could be a really entertaining second base shortstop combination. And if you’re strong up the middle, you’re going to contend. And I can’t wait to see those 2 guys playing together. Michael: Is it still as much fun for you as when you were a kid in the 60s? Marty: it’s still a tremendous amount of fun, but it’s never like when you were a kid and it just meant everything. I can still remember what street corner I was on when I opened a pack of cards and got Mickey Mantle. It’s memories like that, on 65th Place in Maspeth, Queens, opening the pack, standing right there by the seesaw in the playground and getting a Mickey Mantle. I remember that like it was yesterday. So when you’re an adult, you never quite recreate that. But it’s still tremendously entertaining.